Today on episode 40 of the Cloud Stories podcast I’m talking with Matt Wilkinson who is the founder and CEO of Bizink. Bizink helps accountants and bookkeepers grow their practices through their websites and online marketing. Matt has worked with accountants since 2010. He has over 15 years’ experience of digital marketing for his own businesses and other companies as a consultant. Bizink’s mission is to make accountants incredible online. With our websites, content and online marketing, we help accounting firms across the globe win more business, engage their clients and save time. Today’s episode is kindly sponsored by Spotlight Reporting. 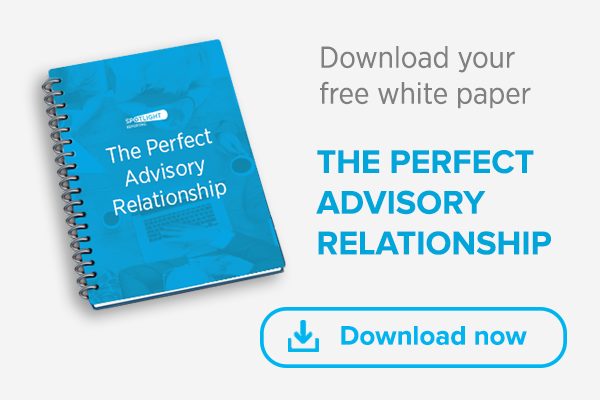 Scroll to the bottom to download your free white paper The Perfect Advisory Relationship. How exchange rate affects cloud based businesses selling globally [pricing and costing]. Developing ideas for products and bringing them to market. Accountants and bookkeepers need to define and communicate their unique selling point (USP). If this is sorted – it makes developing an online presence much easier. Content marketing is similar to inbound marketing. Smart marketers want to get involved with the conversations that people are having online and pull people towards the business. Engaging content pulls business owners towards accountants and bookkeepers. This could be in the form of an e-book or an real event. Great example of content marketing ‘Ultimate Guide to Business Process Automation with Zapier‘ produced by Process.St the simple process and workflow management tool. Matt states ‘We are all in business and need to pay bills. Content marketing needs to convert business owners to buyers. For example include a relevant offer, amongst useful content’. It is great to create cool content – but don’t be shy of making appropriate commercial offers. If your content is targeted you are speaking to the right audience. Hopefully you offer the right services for that audience. They should be interested in that and they won’t be offended if you make a proposal to them. Potential clients want to see actionable things that help them grow manage and run their business. Talk to their pain points. Typical evergreen themes for accountants and bookkeepers include cashflow, business planning. It is good to focus on an industry or niche, better to appear strong to a small audience. The more specific you can make it — the more effective it’s going to be. Using fiverr.com for content writing — nuances and technical commentary was completely inaccurate, but beautifully written. Social Media channels for accountants and bookkeeper:LinkedIn, Twitter and Facebook. Linkedin is a must for networking and publishing posts. Twitter is a research channel, to join in on conversations of what is happening in the industry. You can connect with CEO’s of listed companies via twitter. Also you can distribute content via twitter. Facebook: Matt thinks a lot of firms wasting time on FaceBook, and are not getting leads from it. Content marketing is difficult to track, but it is certainly effective. Google adwords and PayPerClick appears above search engine results such as blog posts. Email marketing if you do it right is one of the most effective forms of marketing and you can track the click throughs. Thanks to Receipt Bank for sharing these stats with me prior to the interview! Cisco Visual Networking Index™ (VNI) Global Mobile Data Traffic Forecast (2015 to 2020) forecasts 5.4 B people will have mobile phones by 2020. With that in mind we discussed whether potential accounting clients really go to a mobile device to search for an accountant or bookkeeper? All accountants and bookkeepers need mobile friendly websites. 23% of traffic to BizInk accountant and bookkeepers sites is from mobile devices. Some firms had as high as 51% traffic from mobile device. If your site is not mobile friendly – then you don’t exist on a mobile device. Websites should not simply be a bland and vanilla online brochure – they need to display a USP a unique selling proposition. Websites need to contain content, typically in the form of a blog. The websites need a call to action. The business needs to continue a relationship with site visitors. This can be done by giving away useful content in exchange for an email address. Going forward BizInk is working on lead generation and lead nurturing, and developing content to achieve this. This helps accountants and bookkeepers convert prospects to clients. Don’t miss an episode! Please subscribe and if you love Cloud Stories the Podcast please take a minute to leave a review.